Dry and split ends are problems that every woman knows. If you feel that a conditioner or hair mask isn't enough for your hair, complete your hair care routine with hair oil to solve the problem. Hair oils help retain moisture in the hair and protect against split ends and breakage. Professional hair oils provides deep nourishment and moisture, frizz protection, thermal protection, UV protection, also it reduce split ends and resists breakage, protect the hair colour and adds incredible healthy shine. On top of that hair oils doesn't weight hair down and leave the hair sleek and soft without greasy feel. Just a few drops and your hair will feel the difference. 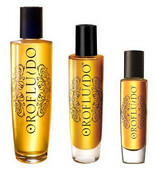 Hair oils are suitable for all hair types. In our sortiment you can find all kinds of hair oils of world-famous verified brands – L’Oreal Professionnel, Kérastase, Matrix, Wella etc. Hair oils contain the most often argan oil, macadamia oil, sunflower oil, almond oil, coconut oil, avocado oil and other precious oils. We also offer 100% natural oils for hair, skin and body: 100% argan oil Diet Esthetic Argan Oil, Brazil Keratin Argan Oil, Brazil Keratin Marula Oil and oil with 99% natural origin ingredients Kérastase Aura Botanica Concentre Essentiel. Moroccanoil Argan Oil Treatment - luxury hair oil with irresistible scent.